Yakima, WA – Borton & Sons, Inc. representatives Denny Annen (President of Sales & Marketing) and Jay Dyer (Director of Sales & Marketing) just returned from the 2014 New York Produce Show and Conference. This year they held the event at the Jacob Javits Convention Center in Manhattan. This was the fifth year this event put on by the Eastern Produce Council and Produce Business has taken place, and Borton’s second participating. There were over 400 exhibitors and a record gathering of 3,000 plus attendees. This year our Borton booth placed emphasis on premium fruit, offered in tray pack as well as 5lb and 8lb soft net bags in an effort to drive additional sales at retail. “The feedback we received was very positive from both current and potential customers” stated Jay. 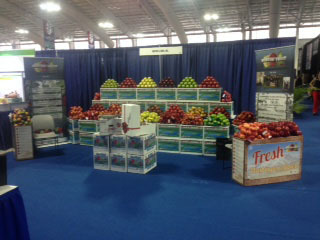 “This year is totally different from previous years and is a great year to be promoting 5lb and 8lb bags of apples. There is true value for the customer this year in these pack sizes. Most customers were in agreement and looking for something new. Overall we need to really be communicating our manifest changes even more than in the past, stay out in front of it and keep the promotions going,” he went onto say. In addition to the show, Jay participated in Hunt’s Point Market Tour. “It gave me a very good understanding of how the market operates” Jay said. “This is the main source of fresh produce in New York City – population of 20 million people! Armata was by far the best overall distributor/wholesaler on the Hunts Point Market due to their complete offering of food safety, sanitation, HACCP approved, and having controlled temp rooms technology in place,” continued Jay. The overall show atmosphere was a casual, comfortable setting and allowed for positive interaction between buyers and sellers at the show. Borton Fruit is looking forward to attending in 2015.